Pashmina (Better known as Cashmere), is a diamond fibre extricated from the body of the mountain goat "chyangra" or "Capra Hircus". This goat is a native of the himalayan belt 10,000 ft above sea level….. existence of this nature's wonder species is very harsh with extremely cold climate and scarce vegetation. Blessed with very thin, short and the softest wool found in the nature. It has an exotically silky texture, weightless lightness but super warmth which when wearing it next to the skin, provides a uniquely tiltilating experience which has been described as Sensual Sublimity by our ancestors. Pashmina, the finest cashmere wool has been popular for centuries among royalty and other elites as the finest, most luxurious wool in the world. For a thousand years or more, this glorious wool has been prized for its warmth, lightness and durability. For lightness and warmth, pashmina wool is unmatched. Delicate and soft to touch, it caresses the skin. 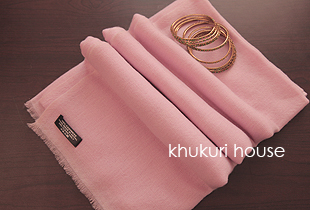 It is not surprising that pashmina has been successful in establishing its uniqueness among fashion wear through out the planet. When you are buying a khukuri blade for yourself, buy this for your ladies.